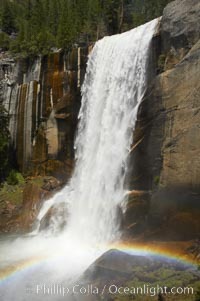 Vernal Falls plummets 317' (100m) through a joint in the narrow Little Yosemite Valley. It is most easily reached by the Mist Trail, a spectacular route along the Merced River from Yosemite Valley's Happy Isles, through the Little Yosemite Valley to Vernal Falls and beyond to Nevada Falls. The final 1/4 mile approach to Vernal Falls takes the lucky hiker up a damp/misty/rainy (depending on the river flow) chute alongside the falls, filled with spectacular views and roaring sound and wind. For the average visitor (i.e., non-mountaineer) this is one of the most exciting and attainable hikes anywhere in the park and is worth the effort even with summer crowds. The rock apron at the top of Vernal Falls offers a view back down the Merced as well as a place to strip down to bathing suits (this is particularly recommended on hot summer days, ladies) and rest in the sun while allowing one's soaking clothes to dry. For those with the energy and fitness, a short break at Vernal Falls is followed by another two mile hike to Nevada Falls, an equally spectacular fall occupying the other major geological joint that defines the Little Yosemite Valley. Here is a panoramic view and QTVR of the Merced River and Vernal Falls.